A Required CD/DVD drive device driver is missing. How to Fix? Installing Windows 7 using a DVD ROM is very easy. But when you use USB Flash drive as the installer disk, some errors can occur. The error 'A Required CD/DVD Device Disk Driver is Missing' is the one main error. This can occur sometimes if you use an out-dated windows installation media on a new model laptop or desktop computer. Unplug the USB Flash Drive and Plug it again. Then continue Setup. Probably this will fix the problem. If not, try the second method. Download the proper chipset driver that include the ACHI Controller from the motherboards manufacturer's website. If you are using Intel chipset motherboard, you can download the files given below. If this not working, you can download the appropriate chipset file from your computer manufacturer's support page. For 64 bit Windows, Download this file. For 32 bit Windows, Download this file. Download this driver files to your Flash Disk. (Removable Disk). After downloading this file, extract them to a USB flash drive. We have to use this flash drive during windows installation. You can even copy this files in to the same Windows 7 bootable flash drive. but, just keep it in a separate folder. 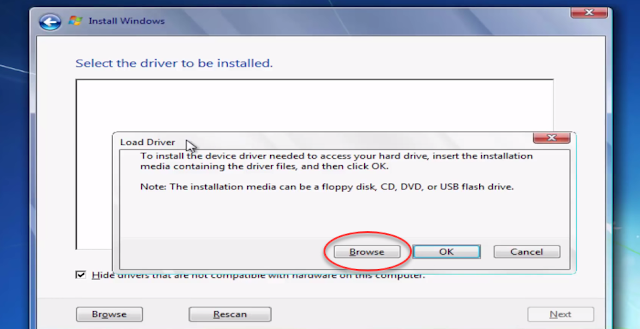 During windows installation, if the error message 'A required cd-dvd device disk driver is missing' pop-up, you can easily browse to this flash drive and navigate to the downloaded driver files. Start your Windows installation as usual. When this error (A required CD/DVD drive device driver is missing), Click on the Browse Button. Select the latest Chipset Family SATA ACHI Controller inf file. Now Your computer will detect the Hard Drive. 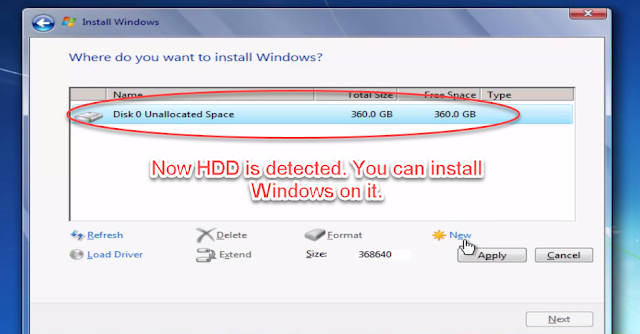 You can use this drive to install Windows.